For the moment, just remember that the UN Food and Agriculture Organization report (FAO) indicates that we currently extract less than 10% of the 43,750 cubic kilometers of fresh water (see 1st link next paragraph) returning each year to the Earth’s rivers, lakes and aquifers. One inevitable question pops into mind: is this just plain carelessness or eco-terrorism? How does it come that despite the so many technological advances, we have not been more efficient globally at redistributing our ‘blue gold’ which Life depends upon but can spend hundreds of billions on standing armies, and now A.I weaponry? As a matter of fact, aquifers can be found almost everywhere. It is more about how deep one is willing to drill to reach them. The climate change argument stands no chance here. Nestle is not the only corporation selling water at society’s expense. It really plays out like a Never Ending Nightmare. There is an exit door though: the only long term solution is to abolish monetarism, we will not resolve the dilemma with the same mindset (profit seeking) that created it. Nestle and co are the embodiment of a fallacious premise. Money, just like happiness, cannot be chased. 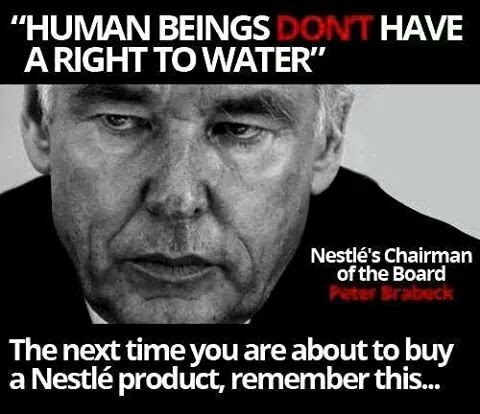 Peter Brabeck, former CEO and now Chairman of Nestlé, thinks we’ll run out of water faster than we will oil, unless we change how much it’s considered a human right. Nestle is under a federal investigation for their water bottling practices in California at the height of the state’s historic drought. Documents have surfaced showing that the company had been pumping water from a mountain spring despite an outdated permit. Lindsay France reports from RT’s Los Angeles studio. Nestle, the world’s largest food and beverage company, bottles Michigan’s water for next to nothing and sells it at great profit. And the state has just approved its request to pump even more, despite the failed promise of jobs and 80,000 public comments against Nestle. Meanwhile, just two hours away, Flint still doesn’t have clean water. Tests on more than 250 bottles from 11 brands reveal contamination with plastic including polypropylene, nylon, and polyethylene terephthalate (PET). When contacted by reporters, two leading brands confirmed their products contained microplastic, but they said Orb’s study significantly overstates the amount. Money and competition are bedfellows, we now have people spending 50% of their salaries on water in the poorest countries and others paying 100 bucks for a bottle in the so-called rich west. To add to the injury, Food And Water Watch contends that almost 50% of all bottled water is derived from tap water!! Did you know that the production of water bottles uses 17 million barrels of oil a year (plastic being essentially a petroleum byproduct) and it takes three times the water to make the bottle as it does to fill it??? Money making justifies the means: 30 billion plastic water bottles sold in the USA in 2005, only 12 %were recycled?!? Then comes the cherry on the cake that is admiring wealth and regarding money as a religion onto itself, without which none of what is said here could be made possible. This is very dark esoteric magic. The Principle Of Mentalism, saying the the Universe is mental, and so is Reality. Materialism is created out of Mental Energy. Of course, this esoteric fact has been known since the dawn of times…. and the secret is now in the open… The Pandora box is open. Get ready for a paradigm shift, a shift in mindset… mindset transitioning will happen no matter what, because now we have enough rational data to explain the Esoteric Universe, and thus expose social materialism and darwinism as the prime causes of our planetary ills.